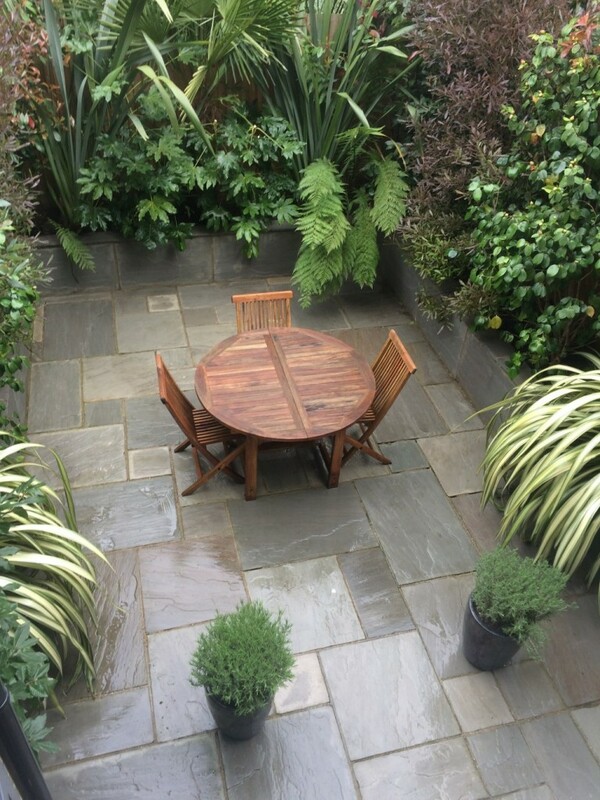 Low maintenance, terrace garden, using a textured evergreen planting scheme with year-round interest. Following a recently completed kitchen extension, our client’s builders had installed the terrace, raised borders, and a tall (rather unattractive!) fence around the perimeter of this rear garden. 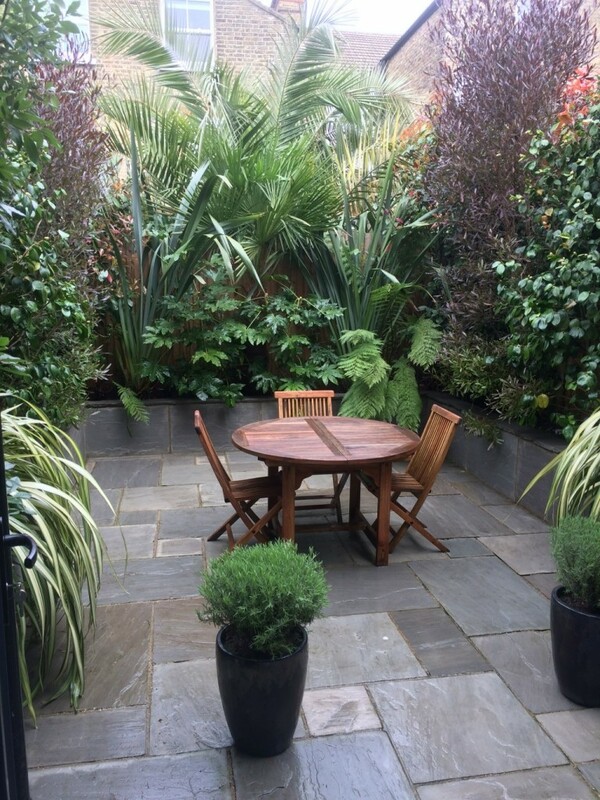 As a busy record label executive, our client had limited free time to tend to his garden, but wanted to create a stunning, evergreen terrace to use all year round for entertaining clients and friends. This private haven needed to look elegant with interest from height, colour and leaf texture and hide the fence! Space for sitting and barbequing was also important. With relatively narrow borders of 50cm deep, the range of plants was limited to those with smaller rootballs. With this in mind, we created a planting plan with a rich mix of evergreens including Phormiums, Tree Ferns, and Camellias. Additional colour came from red flowers and new red leaves, and along with all the various shades and tones of the evergreen leaves, worked well with the grey stone of the terrace. 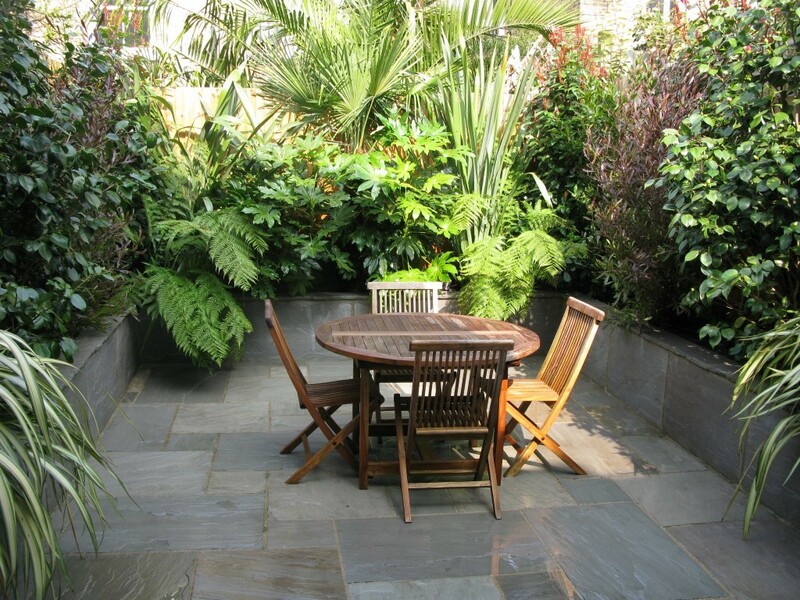 We also ‘borrowed from the landscape’ by working with large tropical-looking plants from a neighbouring garden. By preparing the soil thoroughly prior to planting, using best quality plants, and installing an irrigation system, the plants are flourishing. We now visit his garden once a year to jet wash, shape the plants, and tidy the garden.